This is a block of rough cut pine that had been part of a beam in an old garage. There was a worn out line just off center so I based everything off that. I used pencil to draw and dull chisels to hack the shape. I used a 32 grit sanding block and some 60 & 80 grit paper and then wiped it down with mineral spirits. 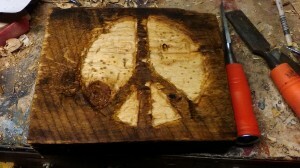 This entry was posted in 365 days of peace, barn board, on-going projects by brighid. Bookmark the permalink.